I recently posted pictures of a box I created from a piece of flat felt. It seems only right to show the steps involved in creating a piece of flat felt. 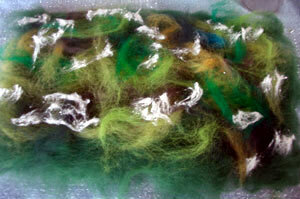 My method is derived from instructions available on Pat Sparks amazing Feltmaker’s List FAQ. Variations on these instructions are provided in the first two books I picked up: The Art of Feltmakingby Anne Einset Vickerey and The Weekend Crafter: Feltmaking: Fabulous Wearables, Jewelry & Home Accents by Chad Alice Hagen. Start by laying out a batt with alternating layers of wool roving. If you want a heavy, thick piece, try using a coarse wool like Jacob or Icelandic. 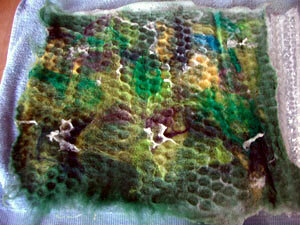 I wanted my piece to be supple and pliable enough for sewing, so I used dyed New Zealand merino wool top. I also wanted it to be fairly thin finished, so I created two layers with my green base color, and then added bits of accent color and silk noil. Four layers of merino will give you a thicker fabric that is still very soft. Pat Sparks also has a great reference chart listing how well various wools felt. Pour a little hot, soapy water over your batt. I use a squeeze bottle because I can control how much water I add to the pile. You can’t really go wrong with soap, but in this very first round, you don’t want the fibers swimming in water as they won’t hold together as you’ve placed them. With a sheet of bubble wrap under my batt, and a piece on top, I rolled it up using a wooden handle I stole from our croquet set. Roll this package back and forth until you are bored, which isn’t very long for me. Unroll the bundle to check on the progress. Tuck in the wispy ends if you want a clean edge, pull and tug it square if you are hoping for a uniform shape, and rotate it 90 degrees to ensure even felting throughout the piece. 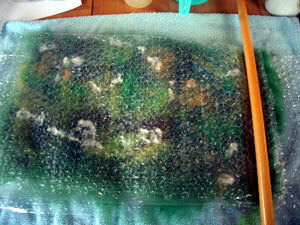 Add more soap and hot water to help the felting process along; the excess will squeeze out the ends of your bubblewrap bundle. Repeat the process several times until the piece feels finished. If you plan to cut out the felt to use as inlay, you may want to stop as soon as the fibers start to hold together. To achieve a firmer piece of fabric, you will need to spend some time fulling it, which for me, means just rolling it up and working it longer; other options include throwing or dropping the piece of felt, or rubbing it on a washboard. This is fantastic – I have been working with children making felt and I have linked to this tutorial on my blog. 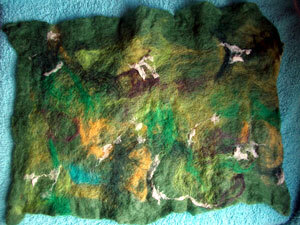 Your felt work is very inspiring.